Do You Remember... "Cisco Kid". While Hoppy, Gene, Roy and The Lone Ranger were the forerunners of B-western-like half hour TV adventures, The Cisco Kid had been around longer than any of them. Created in 1904 by William Sidney Porter (alias O’Henry), after 23 feature films from 1929 to 1950, The Cisco Kid moved to the small screen with his first half hour color adventure, “Boomerang”, airing September 5, 1950. And indeed, it was the color that helped make Cisco unique, even though Gene and The Lone Ranger had both beaten Cisco to the small screen. 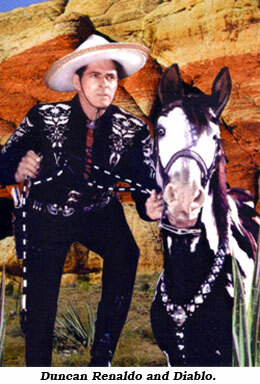 Gene eventually filmed color in ‘55 but only turned out 91 total episodes while Cisco filmed 156 color shows, topped only by the Lone Ranger with 221 episodes, 39 in color. It was shrewd businessman Frederick Ziv, a former Cincinnati advertising man and radio show syndicator, who, in the late ‘40s, recognized syn-dication of TV shows was the coming thing. With monies earned from newsreel and sports footage syndication, he launched his own film production company, taking over The Cisco Kid from film producer Phil Krasne. 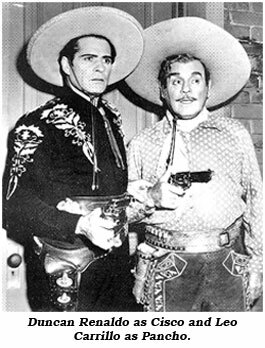 46 year old Duncan Renaldo (riding Diablo) and 69 year old Leo Carrillo (astride Loco) came over from the United Artists features to seamlessly continue playing Cisco and his language mangling but loveable partner, Pancho. Dave Sharpe doubled Renaldo early on, replaced by Troy Melton. Bill Catching (with a little padding) became Carrillo’s double. Much of the exterior footage was shot at and around Pioneertown. The syndicated series ran for 156 episodes through March 22, 1956. Within three years it was earning $40,000 per week profit. In ‘56 it was dubbed and distributed to 20 countries. By ‘59 the show had grossed a total of $11,000,000 in domestic sales. ZIV sold out to U. A. and retired from series production. “Cisco” has seldom been out of syndication someplace in the world since then, due in part to ZIV’s wise decision to film in color. The B-Western feel of the series was aided by the fact dozens of B-movie stalwarts were cast in various episodes: Robert Livingston, Ed Cobb, Peggy Stewart, Riley Hill, Raymond Hatton, Jane Adams, Jack Ingram, Gail Davis, Forrest Taylor, Tom Tyler, Marshall Reed, Dennis Moore, Steve Clark, Tris Coffin, Zon Murray, Myron Healey, Terry Frost, Pierce Lyden, Lois Hall, Kermit Maynard, Carl Mathews, Tom London, House Peters Jr., Lee Roberts, I. Stanford Jolley, Gregg Barton, Kenneth MacDonald, William Fawcett, Rand Brooks, Elaine Riley, Earle Hodgins, Glenn Strange and so many more. As with the actors, directors who knew their way around a horse and a gun were employed: Derwin Abrahams, Paul Landres, Al Herman, Eddie Davis, Lew Landers, Lambert Hillyer, Leslie Goodwins. Ditto with writers: J. Benton Cheney, Royal Cole, Betty Burbridge, Elizabeth Beecher, Barney Sarecky, Andre Lamb, to name a few. “Protective Association” were also reused. For “The Iron Mask” Cisco wears a heavy iron mask for a goodly portion of the story. Stock footage of Cisco pursuing Michael Whalen through a swamp from “Water Toll” was reused. 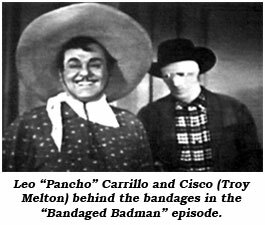 In “Bandaged Badman”, Cisco appears bandaged for most of the episode, posing as a badman. In all, eight episodes were filmed around Renaldo’s absence. After six seasons, 156 episodes, Pancho said for the last time “Les went” and the series leaped into perpetual reruns. In “Cisco Kid: Old Bum” Pancho sez, “Someday, Cisco, you are going to find out that the moon is a mouse and you are the green cheese.